The third book of the Alliances to fight poverty contains the presentations of the seminar held in Lissabon, May 2013. 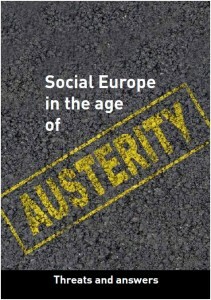 This rich report book made it very clear that social Europe is severely affected by the crisis. Austerity breaks down the rights of people to have good education, a good shelter, enough food, good health services, … and a social life. You find texts on ‘daily life practice’ of social benefits. Social benefits are nowadays used to discipline or activate the beneficiaries. The question is of disciplining people gets them out of poverty. our final question is whether social benefits help to have more equality and equity in the member states? There are also texts that discuss the evolution of social services and social work in the age of austerity. What are the consequences of the tendency of privatisation, disinvestment and the influence of the meritocratic culture for the social services and social work? What are the consequences on health care? Thirdly a lot of texts focus on the fundamentals of Europe: are the threats to our social models provoked by the bases of the singel market? Is the dominace of the singel market a threat or an answer? can we beald a s European social model in times of crisis? and si the basis vor an European social model not a search for more equality between teh European states? With this reportbook we want to open -re-open?- the discussion on the social model of Europe and the serverly negative impact of the austerity model.